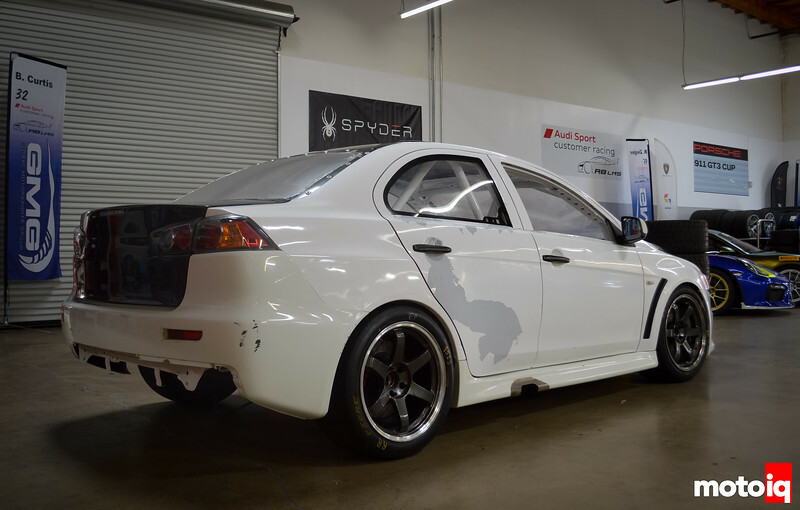 We’ve been working on the CSF EvoX racecar here at the MotoIQ Garage for the better part of the last year, which means we’ve had a front row seat to its latest transformation. 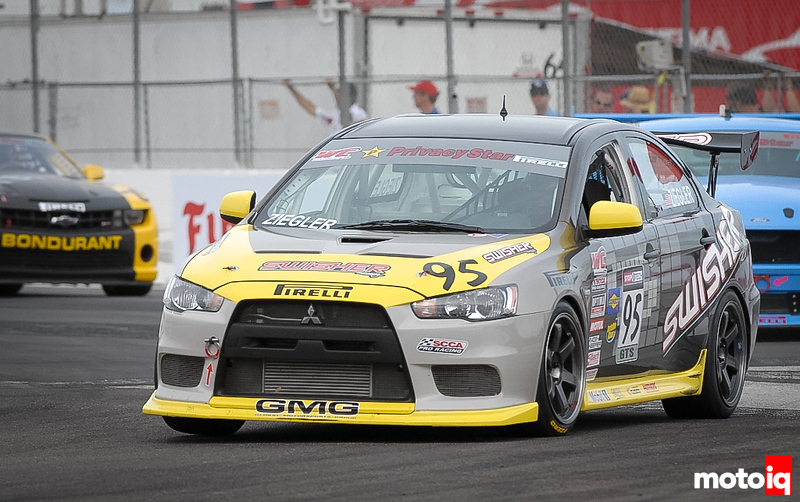 This particular EvoX was once a full tilt wheel-to-wheel racecar that competed in World Challenge’s GTS class, while GMG maintained the car and was in charge of the race program. Fast forward a few years and the poor Evo was now retired and collecting dust in a lonely corner of the GMG shop. It just so happened that CSF and GMG were working together to develop cooling parts for Porsches and that’s how the Evo caught the eye of CSF CEO Ravi Dolwani. That’s where the journey officially begun. The CSF EvoX back in its World Challenge days. It sure looks a lot different now than when it was banging doors on track. Pic borrowed from GMG Racing. Here’s the Evo as it was purchased. It was actually in better shape than you would expect for it being an old racecar. Ravi was able to work out a deal with GMG for not only the car, but also a TON of spares for it. The engine, transmission, rear differential and most of the steering components were already on the car when the CSF team picked up the car, so it was at least easy to move around. Other than those pieces everything else was in boxes and given to CSF without any real inventory. Not that it was an issue considering the price and the parts that came with the car. 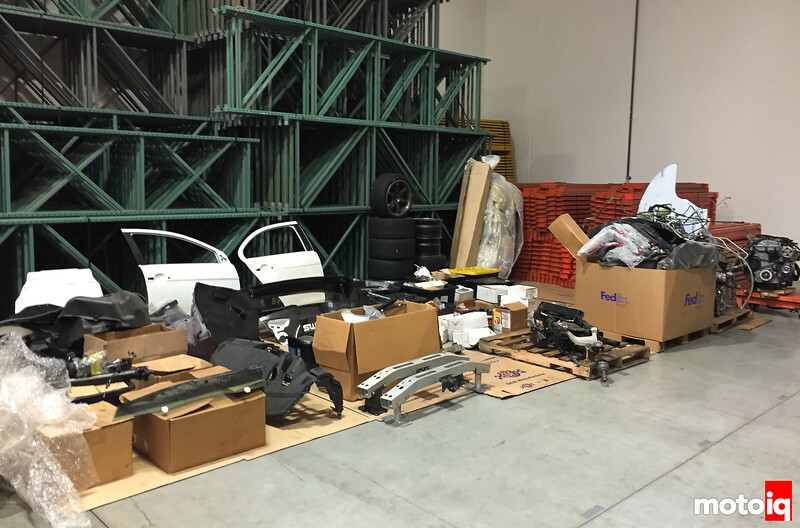 MotoIQ came into the picture shorty after the car and all the parts had been transported to the CSF Southern CA headquarters in Rancho Cucamonga. Being a long time supporter of MotoIQ, Ravi knew of our plans of opening up the MotoIQ Garage to start working on high performance builds, so he immediately approached us about helping him with his new project. The goals were to build a car that could compete in time attack, drag racing or high-speed events like Motovicity’s Never Lift. Though big power numbers were on the list of deliverables, so were reliability and balance. Ravi wanted to be able to show up to any event and be competitive. 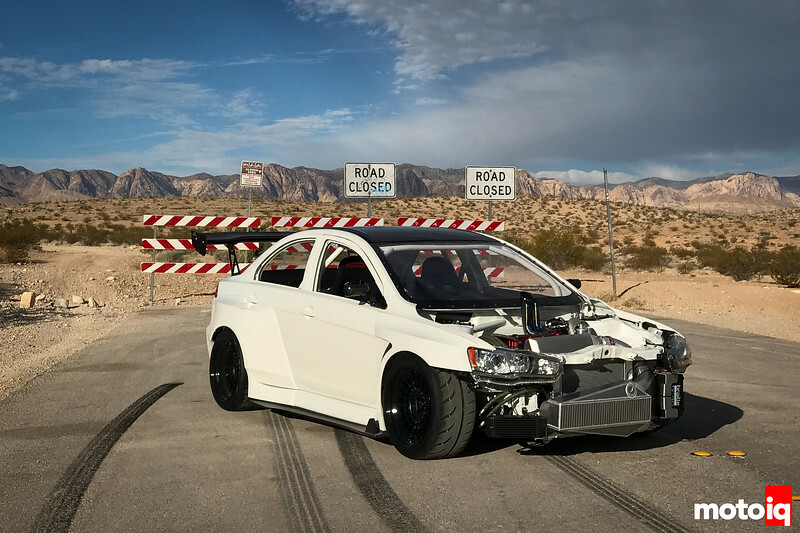 This was going to be quite the undertaking as we personally did not have experience with the EvoX and we were going to be building one from the ground up with no instructions or idea if we had all the necessary parts. A look at the pile of parts that came with the EvoX. This was definitely going to be like building a full size Lego with no instructions! After assessing the situation we developed a build plan for the EvoX’s first stage. The car had to make it to SEMA as a running car, not just a pretty display car that couldn’t move on its own power. The car would be passing through the hands of some of Southern California’s best, but we would need to be on a strict deadline to ensure everyone had enough time to take care of their individuals tasks. The Evo’s first stop would be with the fabrication specialists at Sheepey Built who would be responsible for the custom exhaust manifold, turbo mounting and intercooler plumbing. We knew we were not going to have enough time to spec out and build the engine the EvoX would be competing with. Unfortunately some of the specialty parts we were going to need for the build would simply not agree with our tight timeline. The decision was made to use one of the two World Challenge GTS spec engines that came with the car. As soon as the car arrived at Sheepey Built they performed a leak down and compression test. After everything checked out with the engine it was time to start melting some metals. 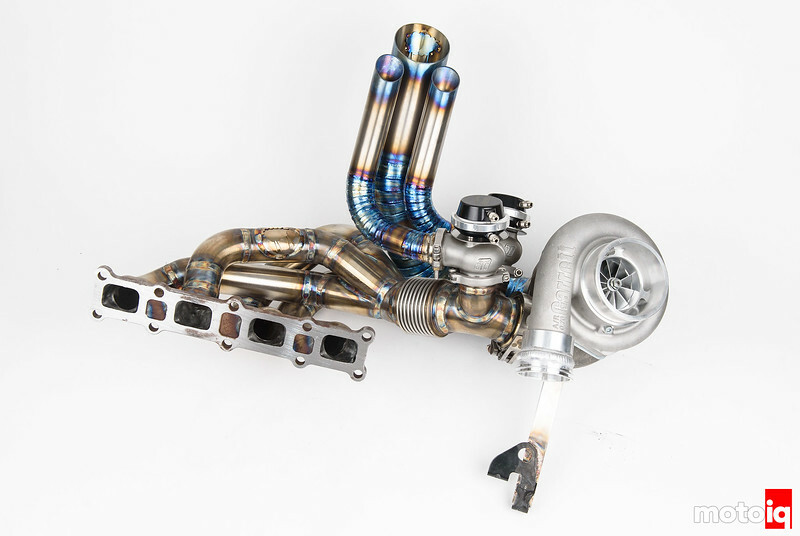 A sneak peek at the beautiful work Sheepey Built did on the custom exhaust manifold for the CSF EvoX Racecar. This would not have been our first choice to place the exhaust’s exit, but we’re all about functionality before form. Ravi wants to win some car shows too, so the build needed to have some compromises. We do have a few leads on some back to back testing that’s coming up that will make for the exact content you’re looking for. We’re keeping our fingers crossed. so when is this race car going to race? Shooting for sometime this year. Getting one of these EvoXs to go fast has not been a plug and play affair. We’ll let you guys in on all the details with the rest of the series. At least it won’t get messed up by falling off crates.